The following article contains misinformation about Yun Gee’s personal life. There is no evidence found that he suffered from mental illness or had any major breakdowns. Furthermore, Yun Gee continued to paint, write and invent throughout the 1940s and 1950s. The rediscovery of a 20th century painter named Yun Gee (1906-1963) has brought about a reevaluation of Synchromism. What is it and how did this artist employ these theories? In the 1920s when Yun Gee was alive and well and living in Paris, fame, even fortune, seemed certain. At 22 he had already had three one-man shows including one at the prestigious Bernheim-Jeune Gallery; he was married to a well-known poet, Paule de Reuss; and he hobnobbed with such luminaries of the Paris scene as Gertrude Stein, Andre Lhote, and Paul Guillaume. More important, he was fulfilling his early promise as a painter. 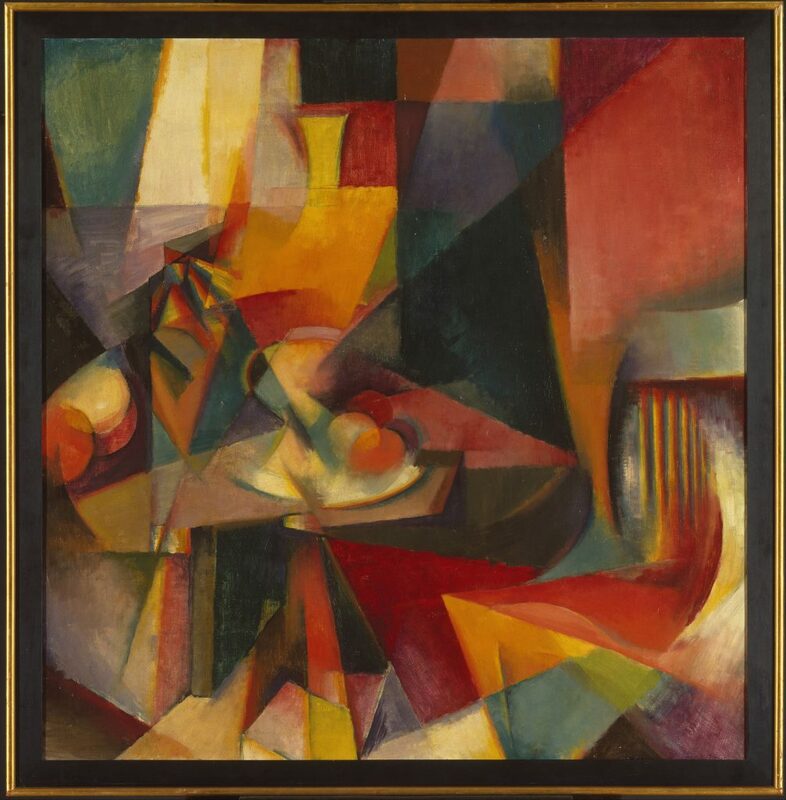 By adapting cubism to synchromistic color principles, he was producing extraordinary personal statements on canvas. The future looked brilliant indeed, and for a while the world seemed his for the asking. A few years later, however, his day in the sun had clouded over. Mental illness, precipitated at least in part by national prejudice, caused Gee’s decline into obscurity. 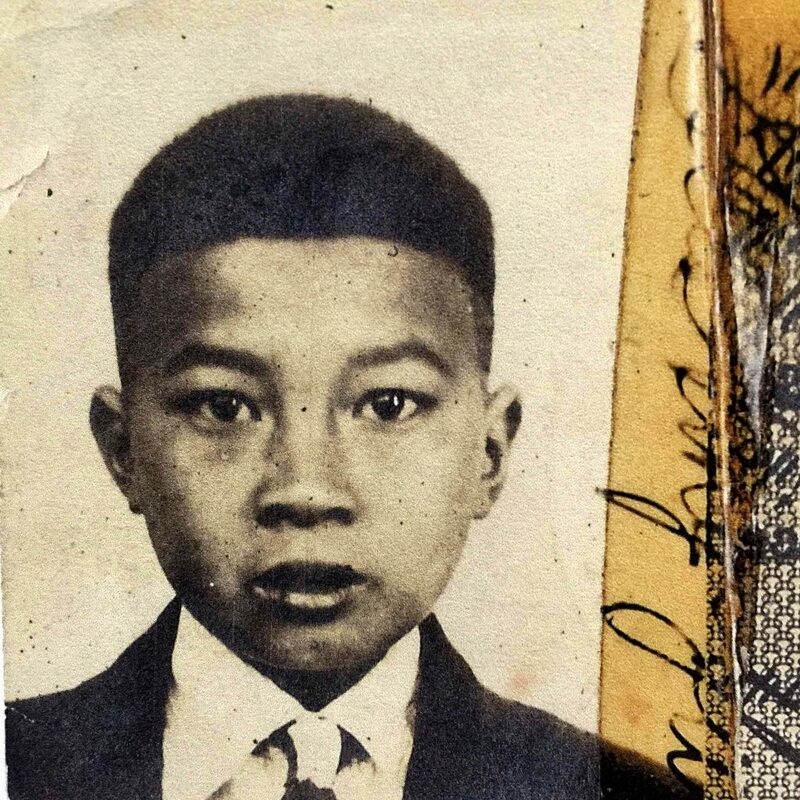 To be young, gifted, and Chinese in America before World War II was not a happy combination. Discrimination against Orientals produced in him an alienation from the society in which he lived, and this alienation in turn, helped to precipitate the devastating illness which cut short his career while still in his 30s. At that time, his brilliantly conceived paintings were fully realized, and he was constantly enlarging the boundaries of his potential. Yet until recently, Gee was a forgotten man. Few people knew his name. Alfred Barr of the Museum of Modern Art, who remembered when Gee’s work hung in the museum, did. So did Robert Schoelkopf, who staged a Gee retrospective at his Madison Avenue gallery several years ago. And certainly Joseph Hirshhorn. Hirshhorn bought up a number of paintings at the show and plans to exhibit one of them at the opening of the Smithsonian Institute’s Hirshhorn Museum in Washington this spring. Today, Gee is being rediscovered. Thanks mostly to the current fascination with American painters, a revival of interest in his work is under way. Still, one cannot help wondering what heights he would have reached if his own madness had not interfered. Gee entered the United States illegally in 1921. His father, who had come to San Francisco some years before looking for work, claimed that his birth certificate proving U.S. citizenship had been destroyed in the great San Francisco earthquake of 1906. The ruse was a common one among alien Chinese, and difficult to disprove. So Gee was granted citizenship as the son of an American, when he immigrated from Canton at age 15. Once in San Francisco, Gee studied painting at the California School of Fine Arts (now called the San Francisco Art Institute) for two years; where he came under the influence of the modern painter and teacher, Otis Oldfield. Oldfield, having “done his time” (then an important part of an artist’s credentials) in Paris, had come back talking enthusiastically about a movement called Synchromism which fascinated Gee and sparked a burst of creative expression. Synchromism was launched as a fully developed aesthetic philosophy in 1913 by two American painters living in Paris – Stanton Macdonald-Wright and Morgan Russell. These intrepid artists challenged the entire French art world in a bluntly worded manifesto that accompanied an exhibition of their paintings. According to William Agee in Synchromism and Color Principles in American Painting, “The Synchromists claimed a radically new and unique function for their color that superseded the ‘elementary’ canvases of Impressionism, and the ‘superficialities’ of Cubism, Futurism, and Orphism.” Wright’s brother, the critic William Huntington Wright, went even further by stating the Synchromism was the culmination of “every aesthetic aspiration from Delacroix and Turner to Cézanne and the Cubists. 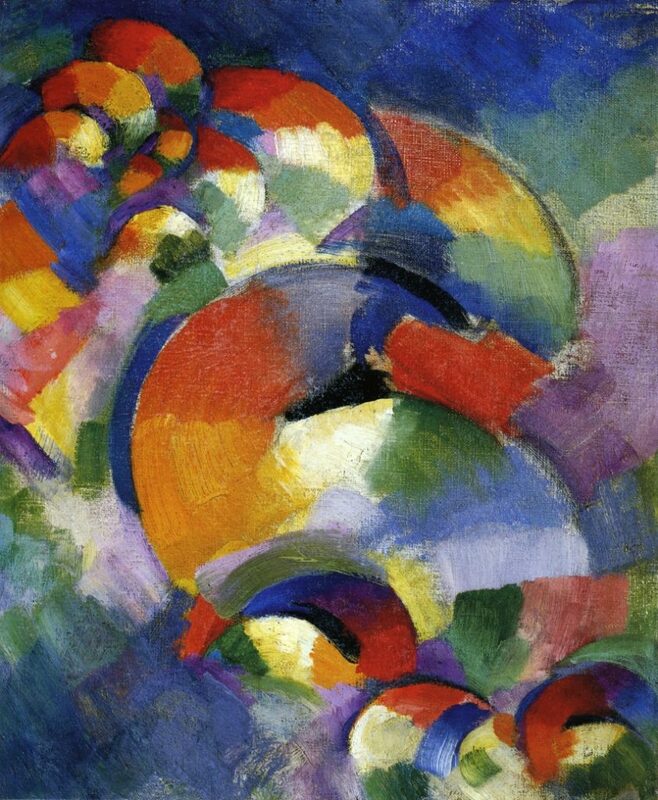 What Wright and Russell had done was to device a system, based on Cézanne’s organization of space and Matisse’s use of color, to build form in space through the optically regressive or aggressive nature of colors. The method drew heavily on the “scientific” color theories of the day that used triads of colors, falling within regions divided 120 degrees on the color circle, to produce balance and harmonious color combinations. “Russell and Wright,” says Agee, “chose a dominant color key in this way for the majority of their abstract Synchromies. After the original key was determined, the chromatic circle was split into other triads to form variations on the dominant chord or color key, which were dispersed throughout the composition to provide a unifying whole of major and minor scales. Unfortunately, the early paintings of these two artists did not measure up to their revolutionary words and the movement per se, was short-lived. Still, it possessed historical importance. Says Milton Brown in American Painting, “Synchromism is one of the integral steps in the general development of French modernism, exploiting a formal idea derived from Cézanne. Though its influence was temporary and limited, Synchromism was the most advanced and radical manifestation of abstract art in those years.” Furthermore, the color principles emanating from it were later adapted by many other Americans, including Thomas Hart Benton, Patrick Bruce, Andrew Dasburg, Arthur Davis, and James Daugherty. Working out from the center was an essential principle in Gee’s teaching as well as his painting. He felt that students concentrated too heavily on the composition of a painting. If, instead, forms were built up from the center in color planes – an admittedly rigid system – the student would forget about composition and let his emotions come through. In other words, he proposed liberation through discipline. Gee also asked his students – mostly Chinese painters raging from 18 to 90 years of age – to paint on paper with pure color. He had two reasons for advocating this technique: First, the inexperienced student frequently muddies color initially when he mixes on his palette and later on the surface of the canvas. Freshness could be ensured, said Gee, by using pure, unmixed color on paper that prevents running and makes surface mixing difficult. Second, because canvas or canvas board is expensive, the student unconsciously becomes inhibited. The painting must be just right to justify the expense, so he works too hard at making a picture perfect. Paper or cardboard, on the other hand, is cheap; it can be thrown away. Gee’s teaching eliminated inhibitions. Moreover, the painted cardboards were not thrown away. To this day, his [ex-wife], Helen Gee, still has many thoroughly charming paintings by his students which compare favorably with much of the art produced today. At the same time Gee was teaching his fellow-countrymen, he had his first one-man show at the Modern Gallery in San Francisco. Princess Achille Murat, a French aristocrat and patron of the arts, saw the show, bought several paintings and encouraged him to work in Paris – heady advice for a man of 20 years. Bigotry also played a role in his departure. Coming of age and learning the facts of life, i.e., Orientals were inferior to Caucasians, was a blow to Gee’s innate sensitivity and precocious intelligence. Paris granted him a reprieve from the barbarism of the Barbery Coast and became his spiritual home. The intellectual circles he traveled in cared little for such chauvinism. The French, themselves, he felt, shared a common bond with the Chinese based on a mutual recognition and appreciation of sophistication and elegance, whether it be in art, music, or even cuisine. Gee flourished in this cultural greenhouse. The handsome young Chinese had many talents besides painting; he played Chinese musical instruments; he wrote poetry and plays; he was extraordinarily knowledgeable in the philosophies of both East and West. And he was able to indulge in these and many other interests in the invigorating environment of Paris in the 20s. As he strove to graft cubist principles onto his style, he was also influenced by the Freudian symbolism of Surrealism. Unlike the work of many exponents of abstract Synchromism and representational Cubism, almost all of Gee’s paintings bear a personal signature in the form of poetic vision and charged-up emotionalism. These manifestations were joined by the appearance of the unconscious. How I Saw Myself In A Dream is the personification of the Freudian dream world. In 1929, the bubble burst for Gee as well it did for the rest of the world. Poverty-stricken and unable to support his wife, who had been disinherited by her aristocratic family when she married Gee, he left for New York where he felt he had a better chance of selling. Once established, he planned to bring her to the States as quickly as possible. The alienation Gee felt in San Francisco toward his adopted countrymen intensified in New York. Yet, in certain respects, the hostile atmosphere ironically brought out the best in his work. To alleviate the pain of isolation he withdrew into himself and externalized his inner visions on an ever greater scale than before. Wheels, for example, brings this response from Pepper. 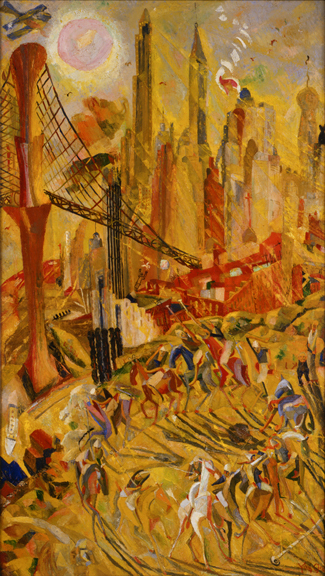 “Drawing upon resources for symbolic imagery hitherto absent from his work, he characterized the galloping frenzy of the new world in the ballet of polo players in the foreground.” The city ultimately defeated Gee, but in Wheels he met its challenge triumphantly. Gee’s reputation increased during the 30s, but not his capital. He existed only by working on the WPA Easel Project and was never able to bring his wife to New York. Finally, although a touching correspondence continued between them over the next 30 years, separation brought divorce. In 1936, Gee suffered the first of several nervous breakdowns. He recovered and in the 40s, married a young student of his and fathered a child. A total mental breakdown occurred in 1945 and he remained ill until his death in 1963. Mental illness was common among all Chinese living in the United States before WWII and their suicide rate was extraordinarily high. Constantly hounded by officials seeking aliens, insulted and assaulted by bigots (Gee himself was attacked several times for walking down a New York street with white women), they clung together in small, secretive groups, frequently not even admitting they spoke English. Hermetically sealed off from the world, the Chinese-Americans existed in an atmosphere that automatically promoted paranoia. The anguish suffered by the average Chinese intensified with status and intelligence: Chinese professionals possessed the highest rate of mental illness among ethnic groups in America. Gee, too, seems to have been infected by the epidemic. Withdrawing into a small circle of protective friends and relatives, he slipped in and out of depressions in the 30s and 40s, probably contemplating suicide from time to time. In Wheels there is a crudely drawn Chinese man shown leaping off a building. 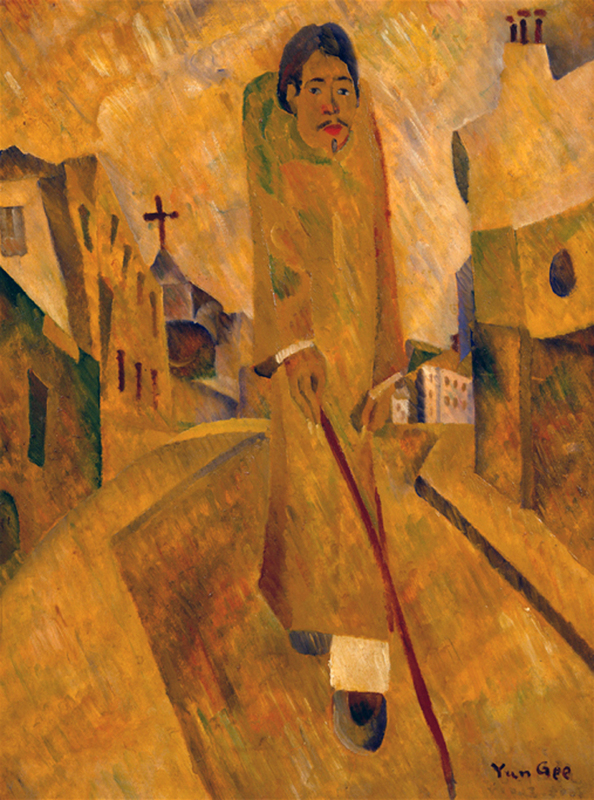 The figure was added after the painting was originally exhibited in 1932, and surely represents the painter trying to escape the unrelenting anxiety generated by the insensitive city. Speculation on the relationship between discrimination and Gee’s mental illness is futile, of course. But there is no question that real injustices aggravated the imaginary fears, which finally destroyed his creativity: an American tragedy.